*Neoliberalism – An approach to economic and social studies in which control of economic factors is shifted from the public sector to the private sector. Drawing upon principles of neoclassical economics, neoliberalism suggests that governments reduce deficit spending, limit subsidies, reform tax law to broaden the tax base, remove fixed exchange rates, open up markets to trade by limiting protectionism, privatize state-run businesses, allow private property and back deregulation. The economic crisis that has been affecting the global economy for the last two and a half years started in East Asia. We’ve heard story after story about the problems in Thailand, South Korea, Indonesia, Malaysia, China, and even Japan—but we’ve heard almost nothing about the situation in the Philippines. Is there something that the U.S. government, the International Monetary Fund (IMF), and the World Bank don’t want us to know about the situation there? International Monetary Fund (IMF) – acted as the mean cop for the global financial system for a long time, but its role in this crisis has brought it new notoriety. *and raise interest rates as high as necessary to keep capital in or attract capital to invest. The Philippines is, in some ways, a special case: while its economic development program has been based on neoliberal principles promoted by the IMF and the World Bank, it did not begin as a response to the recent crisis; the Philippines has been carrying out a neoliberal development program since 1962. *An examination of these experiences, therefore, should give some idea of the quality of “advice” being given to economically less-developed countries by the global watchdogs. When the Philippines was granted “independence” by the United States in 1946, it had been devastated by the Second World War; the United States used this to set up a neocolonial relationship with the now-ruling elites. Economic relief was made dependent on political and economic concessions to U.S. investors, establishment of U.S. military bases across the country, and a currency whose value in relationship to the U.S. dollar could not be changed without the explicit permission of the U.S. President. These impositions, in addition to the extractive economy and corrupt political system, were all “grants” to the newly freed nation. But this industrial progress came at a cost: the state maintained the peso at the incredibly overvalued rate of two pesos to the U.S. dollar (established by the U.S. government before “independence,”) and this made it increasingly difficult for agricultural exporters to find markets for their products, though it aided the industrialization program. *Key to the EOI strategy was the establishment of the export processing zone at Mariveles, Bataan. But what has happened since the overthrow of the dictator? Marcos’ successors—Corazon Aquino (1986-1992), Fidel Ramos (1992-1998), and Joseph Estrada (1998-2004)—have continued to follow an EOI strategy. Aquino committed her government to repaying all foreign debts, including the ones that only benefited Marcos and/or his “cronies,” and Ramos and Estrada have followed suit. -and for the poverty rate to decline to at least 50 percent. –>He missed all three. The Philippines was hit by the global crisis, becoming one of the Asian Development Bank’s “Crisis-Affected Countries.” Philippine GDP, which grew 5.2 percent in 1997, fell 0.5 percent in 1998, according to the IMF. The peso, which had been trading at approximately U.S. 1.00 dollar: P25 throughout most of the 1990s, lost over 40 percent of its value, falling to a rate of 1.00 dollar: P45, although by the spring of 1999, had recovered somewhat to trade around 1.00 dollar: P40. 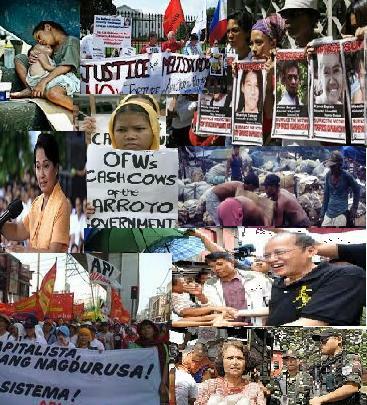 A neoliberal approach to development, as advocated by the World Bank and the IMF, has only benefited the global capitalist political-economic networks (including certain Filipino partners), and the Philippine state; and these benefits all come at the direct cost of the large majority of Filipinos. This program has failed on its own terms and been a social disaster as well. * The Hello Garci Scandal (2005—present), or simply Hello Garci, is a political scandal and electoral crisis in the Philippines. The scandal involves incumbent president Gloria Macapagal-Arroyo, who allegedly rigged the 2004 national election in her favor. The official results of that election gave Gloria Macapagal-Arroyo and Noli de Castro the presidency and vice-presidency, respectively. Hundreds of national and local positions were also contested during this election. The scandal and crisis began in June 2005 when audio recordings of a phone call conversation between President Arroyo and then COMELEC Commissioner Virgilio Garcillano allegedly talking about the rigging of the 2004 national election results, were released to the public. 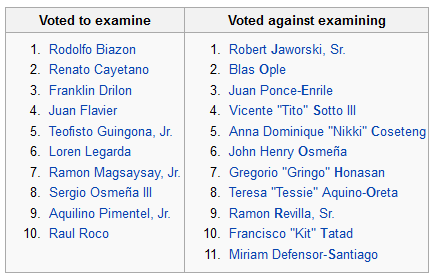 This escalated, when the minority of the lower house of Congress attempted to impeach Arroyo. This was blocked by Arroyo’s coalition in September 2005. No trial has taken place thus far. Allegations against Arroyo and her accomplices in government are many, including electoral fraud and a subsequent cover-up. The administration has denied some of the allegations and challenged others in court. The House of Representatives, which is dominated by Arroyo’s coalition allies, denied attempts for an impeachment trial. Arroyo’s most well-known alleged accomplice from the electoral commission, Virgilio Garcillano, was missing for a few months, but has returned to the capital in late 2005. Allegations persist regarding possible conspirators from the government who helped in his escape, and another alleged cover-up. Garcillano denied any wrongdoing, before his disappearance, and after his return. In December 2006, Garcillano was cleared of perjury charges by the Department of Justice. A Senate investigation is ongoing. * The Philippine National Broadband Network controversy (also referred to as the NBN/ZTE deal or NBN/ZTE mess) involved allegations of corruption in the awarding of a US$329 million construction contract to Chinese telecommunications firm ZTE for the proposed government-managed National Broadband Network (NBN). The contract with ZTE was signed on April 20, 2007 in Hainan, China. Following the emergence of irregularities, President Gloria Macapagal-Arroyo cancelled the National Broadband Network project in October 2007. On July 14, 2008, the Supreme Court dismissed all three petitions questioning the constitutionality of the national broadband deal, saying the petitions became moot when the project was cancelled. Governor Chavit Singson of Ilocus Sur, a presidential friend and known protector of illegal numbers game called jueteng, accuses the president of the republic of the Philippines, Joseph Estrada, as the “lord of all jueteng lords” for receiving 5 million pesos protection money from jueteng every month during his term of presidency. He also accuses the president of receiving kickbacks from 170 million pesos excise tobacco tax. Clamor for Erap’s resignation starts. Political and economic crisis worsens. The Impeachment Trial starts. The Chief Justice of the Philippines, Hilario Davide Jr., is the presiding officer and the 22 members of the Senate are the judges. A verdict of conviction from 15 senators is needed to remove the president from office. During the impeachment trial, a bank executive testifies that Estrada has a hidden bank account in the Equitable-PCI Bank containing 500 million pesos (an amount not stated in Estrada’s Statement of Assets and Liabilities) using a different name, which is “Jose Velarde.” The defense objects to the testimony on the grounds of irrelevancy and immateriality because the said allegation is not included in the Articles of Impeachment. The presiding officer overrules the objection, however, he insists that the testimony will be accepted as evidence only after the prosecution proves that the 500 million pesos contained in that bank account is indeed ill-gotten money. Two days after the trial resumed from a week-long Christmas break, former Finance Department Secretary and colleague of the president, Edgardo Espiritu, testifies that the accusations alleged in the Articles of Impeachment with regards to the president’s betrayal of public trust, are undeniably true. A new set of evidence inside a BROWN ENVELOPE is voluntarily given by a bank for the impeachment trial. The new set of evidence is said to prove that the 500 million pesos on a hidden bank account is ill-gotten and belongs to Estrada. It is also said to prove that the president owns more hidden bank accounts, all under different names. The prosecutors are told that the amount contained in the various hidden bank accounts totals to 3.3 billion pesos. Unfortunately, majority of the senators/judges (11 out of 21) votes to bar the opening of the mysterious BROWN ENVELOPE on the grounds of immateriality (not being included in the Articles of Impeachment). Prosecutors interpret the decision as suppression of truth and an early sign of an acquittal verdict for the president. They walk-out of the courtroom. Anti-Estrada spectators in the courtroom walk-out too. Rene Cayetano, Franklin Drilon, Juan Flavier, Teofisto Guingona Jr., Loren Legarda, Ramon Magsaysay Jr., Sergio Osmena, Aquilino Pimentel, Raul Roco, Rodolfo Biazon. Senator Robert Barbers is not present during the entire impeachment trial due to his confinement in a US hospital. 11:00 PM Militant groups, the civil society, left-wing groups, and a large anti-Estrada crowd unites in protest against the decision of the 11 senator-judges to bar the evidence. They gather in the EDSA Shrine, located on the intersection of Ortigas Avenue and Epifanio de los Santos Advenue (EDSA) in Quezon City. Jaime Cardinal Sin, a prominent figure during the widely popular1986 EDSA People Power, once again, calls on Filipinos to proceed to EDSA and stay there until, using his own words, “good has conquered evil”. EDSA People Power II is formally launched. Other key figures in the 1986 EDSA People Power join the growing crowd in EDSA, like former presidents Corazon Aquino and Fidel Ramos. The impeachment trial is adjourned because of the prosecutors’ resignation. Date of the trial’s resumption is left undecided. A crowd numbering to 100,000 is already in EDSA. The number of people in EDSA triples. They form a “Human Chain” from EDSA Shrine in Ortigas Avenue to Ayala Avenue in Makati City. This is to show Estrada that hundreds of thousands of people are already demanding his resignation. More and more prominent personalities and even friends and former colleagues in the entertainment business of the president are already calling for him to step down from office. Talks about the military’s and police’s withdrawal of support to the president spread. News about withdrawals of support to the president of the military and police is confirmed as high ranking military and police officials join the crowd protesting in EDSA. The military’s and police’s withdrawals of their support are key factors in making a president incapable of performing his duties. More than half of the president’s cabinet members and a number of top government officials withdraw their support too and join the rally in EDSA.. All of these withdrawals of support give a big boost to the anti-Estrada crowd gathered in EDSA. Number of people rallying in EDSA, is believed to have already reached nearly two million. And yours truly is proud to be one of them! 5:00 PM Estrada, for the first time in the last four days, is on television. Estrada addresses the entire nation and insists that he will not resign and would like the impeachment trial to go on. He adds that he already instructed his lawyers to allow the opening of the mysterious BROWN ENVELOPE. He stresses-out that only a conviction verdict from the impeachment trial would force him out of office. However, the people, with absolutely no hesitations, rejects Estrada’s proposal. 6:15 PM Estrada is again on television addressing the nation, not his resignation, but a proposal to include a presidential snap election in the upcoming May congressional and local elections. In addition, he promises not to run in this special election. As expected, the nearly two million EDSA crowd, junk the proposal and instead give the president a 6:00 AM deadline to leave office. If he insists on staying, the crowd will march to Malacanang, and force him out. Amidst negotiations for a peaceful transition of power, the 6:00 AM deadline is not met. About one-third of the people in EDSA, march to Malacanang and occupies Mendiola, a street near Malacanang, where a measly group of an estimated 500 Estrada supporters were gathered but forced to retreat. Despite the president’s resistance to resign, the Supreme Court makes a unanimous decision to file a resolution declaring the position of president vacant therefore allowing the constitutionally-mandated successor, the vice-president, Gloria Macapagal-Arroyo, to take over. At exactly 12:00 noon, Gloria Macapagal-Arroyo takes her oath of office in the presence of the countless people in EDSA and becomes the 14th president of the Republic of the Philippines. Afterwards, she gives a 14-minute inauguration speech. The joyfulness of the crowd is indescribable. 2:00 PM Ousted president Estrada sends a letter to the media stating his doubts on the constitutionality of Gloria Arroyo’s proclamation as president. However, he also states in the said letter that he doesn’t wish to be a negative factor in the ‘healing process’ of the country, so he already stepped down from office. Once again, the Filipinos have shown to the entire world their sense of unity for peaceful & non-violent protests! The spirit of EDSA lives on! Weeks after EDSA 2, Estrada insisted that he never really resigned and therefore is still the president of the republic. He added that Gloria Arroyo is merely an acting president. Estrada insisted on these in order to gain immunity from the plunder and other criminal charges filed against him. The law states that the president of the Philippines and other high ranking public officials have immunity from criminal charges filed against them until their term expires. However, the Justices of the Supreme Court, basing from the actions of the former president during his last hours in Malacanang, unanimously agreed that he undoubtedly resigned from office and because of this; he is no longer the president and no longer enjoys immunity from criminal charges filed against him. Estrada appealed the Supreme Court’s decision, but the appeal was unanimously denied. During the last week of April 2001, Estrada was arrested for plunder charges. The supporters of Estrada protested the arrest by staging what they called “EDSA 3.” It lasted for nearly four days. It was reported that most of these people were “paid” to go to EDSA by public officials who are close allies with the former president. They demanded Estrada’s return to power even though there is absolutely no constitutional way he can return to office. Prominent allies of Estrada in politics persuaded the protestors to march towards Malacanang. However, they abandoned these rowdy realists afterwards. At early morning of May 1, pro-Estrada realists marched to Malacanang and attempted to enter the presidential palace. Military men have already barricaded it, and using maximum tolerance, made the unruly pro-Estrada crowd retreat. The supporters of Estrada created a riot by throwing rocks, burning cars, destroying police stations, hurting policemen and even news reporters. They failed in their endeavour to bring Estrada back to power. They, along with other prominent Estrada allies who persuaded them to march to Malacanang were accused of “rebellion”. By the unquestionably rude and violent actions perpetrated by these Estrada supporters, this gathering cannot be truly called EDSA 3 because rallies in EDSA are always characterized by peaceful, non-violent protests.